You can’t beat a fresh juicy peach on a hot summer day, but you can come close with this delightful smoothie. It’s easy to whip up for breakfast, a snack, or as a healthy dessert. And this is sure to be a favorite with kids, especially the picky ones. Before I get to the recipe let’s take a quick look at a few of the health benefits attributed to the ingredients in this smoothie. Mucho Vitamin C: Peaches and strawberries are high in this key vitamin. Antioxidants Galore: You’ll get plenty of these free radical scavengers from this smoothie. Anti-Inﬂammatory Action: Kick inflammation to the curb with the anti-inflammatory action of peaches, strawberries, and cinnamon. Good Digestion: Ensure proper digestion, and colon health, with the dietary fiber found in the fruit and probiotics in the yogurt. Additional Vitamins and Minerals: Besides being high in vitamin C, this smoothie also contains good amounts of beta carotene, calcium, magnesium, manganese, folate, iodine, potassium, and vitamins B1 and K.
Drink your way to great health with smoothies like this! If you don’t have strawberries, feel free to substitute another berry or combination of berries. There’s no need for a sweetener with this dude, the fruit provides plenty of flavor. Enjoy! Place all the ingredients into your high speed blender and blend for around 30-45 seconds or until your desired consistency is reached. 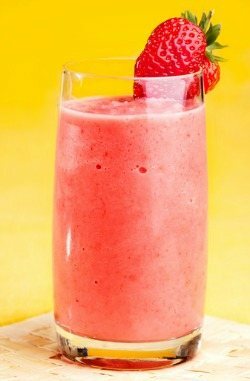 Please leave a comment below if you try this delicious peach strawberry smoothie. Happy Blending!